When the farmer's market opens in the spring it's pretty much just asparagus and rhubarb. And plants. Lots of plants. I buy asparagus every Wednesday and Saturday until it's gone, since this is the only time of year it's in season! I roast it, steam it, put it in quiches, eat it with pasta...I could eat it every day and not get sick of it. But rhubarb is a little trickier. I love its bright, tangy flavor, but I don't always know how to best use it. It's often combined with strawberries, but those haven't quite appeared yet (they're coming soon!) and I don't have any in the freezer from last year, so my rhubarb has to stand alone. We've been enjoying it in two ways this year: rhubarb compote, and rhubarb coffeecake. The compote is easy enough: chop a few stalks, put it in a small saucepan with a splash of water, add a little sweetener and cinnamon, and cook until it softens. Eat it by itself, in your oatmeal, on your pancakes, or on top of vanilla ice cream. And this coffeecake is a cinch, too. I've made it twice in the last week and that's probably not the last we'll see of it this season. :) Even better, the batter is soaked to provide better absorption of nutrients. 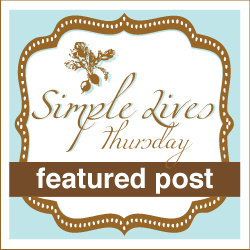 Don't be intimidated by that step - you can do this! Start this the day before you want to bake it. Be sure to plan ahead! 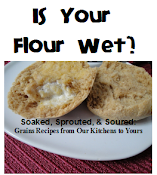 You are welcome to try it with all whole grain flour, but I haven't tried it yet. I think the texture is perfect with the 1/2 c. of all-purpose flour added, and I don't freak out about it since we eat mostly whole grains. If you do use all whole grain flour, add it all to the soaking step. Make sure whatever dairy you use is cultured. If it isn't, add 1 T. of raw apple cider vinegar or lemon juice to the soaking step. Chop the rhubarb coarsely if you want noticeable chunks, or finely if you want it to have more of a vague rhubarb flavor. I like chunks. To soak the flour, combine with the cultured dairy in a stand mixer (or mix by hand) until evenly moistened. Cover with a damp towel and a plate and put in a warm place for 7-24 hours. When you are ready to bake the cake, preheat the oven to 350 and grease two 9-inch cake pans or one 9x13-inch pan. Chop your rhubarb and set aside. Stir together the all-purpose flour, baking soda, and salt in a small bowl. Remove the soaked dough from your mixing bowl (you can place it on the plate you used to cover your bowl). Cream together the butter and sucanat. This will take a little longer than you're used to with regular sugar, but be patient and keep mixing until it is evenly combined (you'll still see little pieces of sugar, that's ok). Add the soaked dough back in and mix until there are no chunks of dough left. Be sure to scrape the sides and bottom of the bowl. Add the vanilla, and then the dry ingredients, then the rhubarb, mixing after each addition. Mix just until combined. Spread into the prepared pan (it may not reach the sides, but it will spread out as it bakes). Prepare your topping: Mix together the butter, sucanat, flour, and cinnamon until evenly combined. Sprinkle over the batter. Bake for 25-30 minutes for rounds, or 30-35 for 9x13, until golden brown and a toothpick comes out clean. Cool 20 minutes or so before serving. If you want to take it to the next level, serve with rhubarb compote on top! 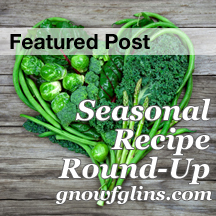 This is now also a part of the Seasonal Recipe Round-up at GNOWFGLINS. Hi Joanna! This looks phenomenal! 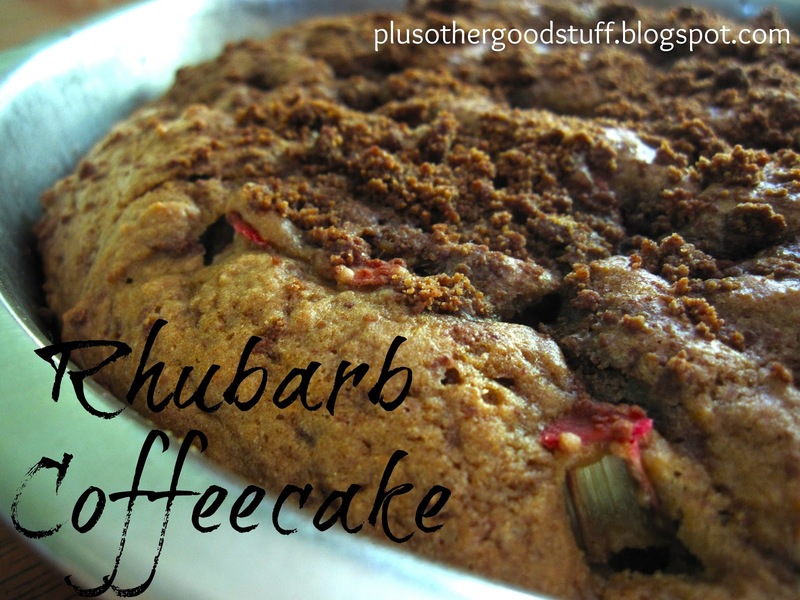 So far my favorite rhubarb recipe is either my Mom's, (your grandma's) rhubarb pie that has a bit of a crispy coating on top and my sister's (your mom's) Rhubarb Coffeecake-to die for!! But I know, both are made with white flour and plenty of sugar. I just came across this recipe on Real Food Wednesday and am so glad I did. This looks delicious and simple. Bookmarking and hope to try it soon. Sarah, you're right, that's a mistake! I must have meant vanilla where I wrote buttermilk. I fixed it now. Thanks for catching it! We made this recipe this morning! We adapted it slightly-- decreasing the overall sweetener to 1/4 cup sucanat and 3/4 cup honey and roughly chopped the rhubarb and did around 3 cups instead of 2. Because of the extra moisture with the honey, I believe we cooked it for a little bit longer, perhaps 45 minutes or so. I liked it better than the King Arthur Flour original!